When we announced that we were going camping for the first time with our young kids, our friends thought we were brave. When we told them we were not staying in a cabin or an RV but in a tent, they thought we were out of our minds. I understand that for people who have never camped, it seems to be complicated and obviously if you hate camping, I would not advise you to bring your children. In reality, camping with kids is pretty simple, so I’ll try to answer all your questions! Simply because my husband and I love it. There hasn’t been one year we haven’t camped since we’ve met. We go in summer, in spring and autumn. There is always a moment when we feel we need to get away. When we’re camping, we feel we can completely disconnect from the daily grind and we feel we’re on vacation instantly. Everything is simplified, we only bring the essentials, there is no cleaning or tidying up, we simply get back to the basics. 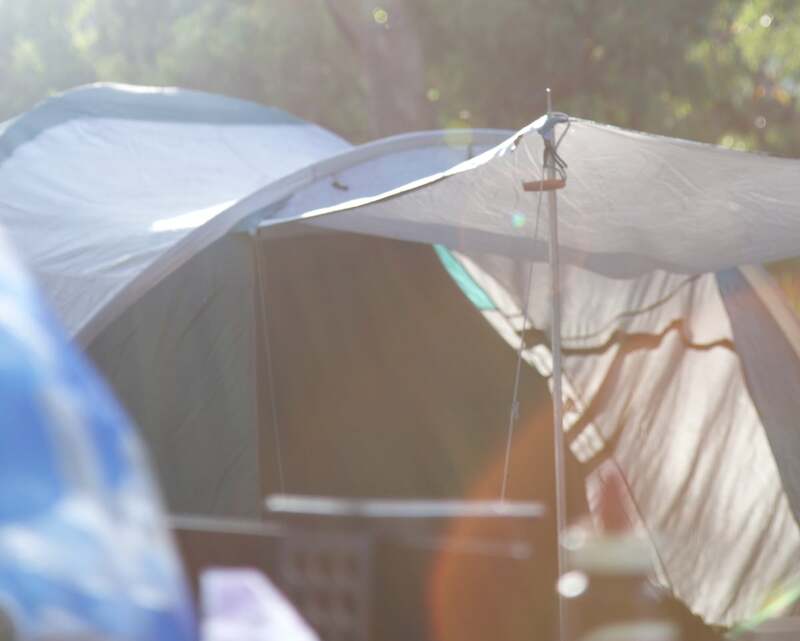 When our eldest was 6 months old we went camping but we only had a small tent, no chairs, no table. We realized that it wasn’t very practical with the family, but that did deter us from camping, we’ve just equipped ourselves a bit better since. Today we have everything we need without having the car completely full to the roof. What equipment do you need for 2 adults and 2 children? We have an 8 person tent which a little bulky but super convenient, and a table and 4 chairs. For the children we brought a queen size inflatable bed and they each have their own sleeping bag and pillow. We also take couple spare blankets in case it gets a bit chilly at night. Fortunately it hasn’t happen to us with kids, but I admit the tent we have is super waterproof so I’m not too worried about getting wet. We’ve been rained on in the past but never got wet inside. It is also a good family size tent and you can easily hang out in there for a few hours while waiting for the rain to stop. One piece of advice though, you should plan some games to keep everyone busy inside if it does happen to rain. Nothing worse than having young kids trapped in small room not knowing what to do with themselves. It’s also worth checking the local area for indoor activities should you need a plan B. We always plan our meals in advance and we try to have at 3 days worth of food in a box and in a cooler that we keep filled with ice. Most campgrounds sell ice on site so you don’t constantly need to leave the site to get ice. Even better if you have a small fridge running off your battery. This is our next investment. Regarding our menus, we prefer fresh produce, large salads and cold cuts. For warm dinners, we bring canned vegetables with meat or fish … just like home. There is always the snack bar at the campground or a pizzeria in town if you don’t feel like cooking. Whe we first started camping our youngest was still drinking milk so we warmed the bottles and jars on the camping stove in a pot of boiling water. So, how is it to camp with children?? To be honest, it’s really easy!! I was a bit worried about our youngest’s siestas, because of the heat. It turns out the heat was not a problem, it was sunny but rather cool and she napped for about 2 hours everyday. At night, everyone slept like a baby, including my husband and I. The kids went to bed at sunet and slept all the way through until after sunrise! The kids are always so happy to be outdoors, I have never seen them smile so much! I find the kids to be very autonomous, playing together and with other kids. They barely play with the toys we bring! They have fun finding rocks and bugs, playing with grass, sand, pine cones…. I think they love it as much as we do! Previous articleDIY Fidget Spinners + Free Template!